Awesome and strange sea creatures consistently populate the TRACC artificial reefs, but sometimes we get especially lucky. This week we spotted a Spanish dancer nudibranch on the algae crusted “swim through “ of the house reef. 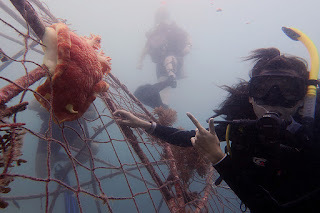 This domed structure crafted from bent PVC pipes and covered with netting is popular with a variety of fantastic sea creatures including octopus, many many types of tropical fish, and tiny crabs and shrimps hiding between the netting and crevices in the cement and topsy-turvy bottle reefs, among many other creatures both resident and visitor. 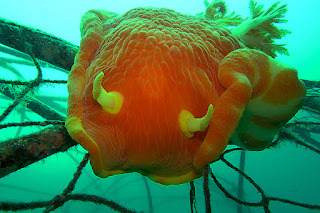 Yet, news of this giant nudibranch, roughly measured at 40 cm, created waves through camp, with divers running to gear up and see it for themselves. The Spanish Dancer is the largest of the nudibranch family and gleams its namesake from its resemblance to traditional flamenco dancers. Its bright red, orange, and yellow coloration are reminiscent of the costumes of the traditional Spanish costume. When threatened, it swims through the ocean, twisting, flaring, and undulating its wide ruffled red and orange underside in imitation of the flamenco dance. As an added touch, these twirling sea slugs are simultaneous hermaphrodites. 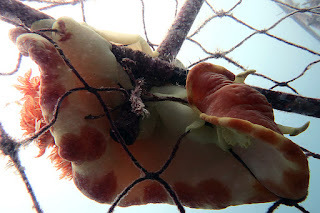 They can not self fertilize and do require a mate in order to lay eggs, but once they mate, they lay their toxic and brightly colored eggs in an outwardly spiraling ribbon around the coral, creating a rose shaped offering to the reef and further fulfilling their namesake. This sighting was a special experience for us all, including many of our instructors and Divemaster’s who have logged hundreds of dives. After the sighting and the combined hours spent observing this rare creature, the atmosphere at camp was filled with a communal feeling of the privilege and excitement of seeing such a rare creature. The feeling was intensified through sighting this Spanish Dancer on a TRACC built structure, providing the added satisfaction of seeing the conservation work TRACC has completed being populated and utilized by the ocean creatures we all love and strive to protect.